Sur Iron is manufacturing welding machines for more than four decades and is one of the largest manufacturers of Arc Welding machines in India. Vast manufacturing experience, strong R&D and a combination of Performance proven design with latest foreign technology has enabled Sur Iron to offer the new XR series of Powerful, Reliable & cost effective D.C. Arc Welder for todays demanding situations. SURARC XR series will deliver uninterrupted, quality welding day in and day out. 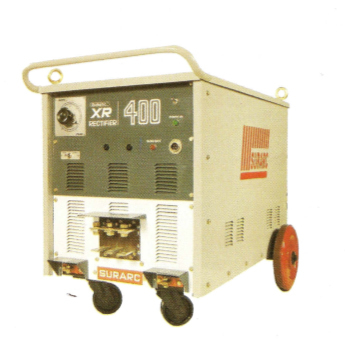 The SURARC XR-Series Transductor Controlled Rectifier Welder (300,400 & 600 Amps.) is a versatile, low ripple DC Power Source which can be used for SMAW (Manual) and GTAW (TIG) applications. . XR-Series offers good arc striking and arc stability using two current ranges ensuring radiographic quality welding. Designed to withstand rough handling, it is ideal for outdoor operation and extreme site conditions. The Power Source has swivel type front wheel and a large diameter fixed rearwheel for easy manoeuvrability. In view of continuous development, Sur Iron reserves the right to modify/alter the design and/or specifications without any prior notice.